For more industrial work spaces or areas that have other maintenance issues, vinyl composition tile (VCT) might be the right answer. VCT is relatively cheap to install and is very easy to maintain as long as the proper waxing is applied. You are probably familiar with VCT in schools, churches and governments buildings. If the commercial wax begins to yellow or to show scratches, it is easily stripped up and a new wax coat is applied. In this way, you can keep a VCT floor functional and looking good for decades. Sheet vinyl comes in residential grades, which is great for employee kitchen and dining areas, as well as commercial grades. 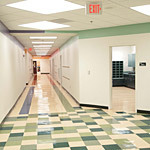 Commercial grade sheet vinyl is great for high-traffic or wet areas. An excellent option for entrances or conference rooms where you meet and greet clients, ceramic tile has a classic look and style that makes a nice presentation to your visitors. Extremely durable, ceramic is an install-and-forget type of floor as it will require minimal maintenance and is difficult to ever damage or wear out. While it requires little maintenance, commercial laminate is a great option if you’d like to have a wood or ceramic look in your workspace but don’t want the cost associated with natural products. Plus, laminates are very forgiving when presented with an active work force. Your common areas and passageways will retain their good looks no matter how many people are using them on a daily basis. Call or click today to set up a free no obligation shop-at-home appointment with one of our design consultants today.